If you are not used to reading Hebrew with comprehension and with the ability to dilate the Hebrew from the literal meaning, or if you cannot read Hebrew and need a resource for daily davvenen, I offer you this set of texts, which I, too, use frequently for myself. I translated the Psalms and the liturgy in the way in which I experience them in my feeling consciousness. This does not offer the ‘pshat’, the literal meaning of the words, but the devotional interpretation that can make it a prayer of the heart. I suggest that you davven it first all the way through, reading it out loud enough to hear it yourself with feeling. You will like some sections better than others. However, as you will note, there are 5 sections to this heart siddur. They describe the raising of your awareness from the realm of sensation, the prayer of Assiyah, to the realm of feelings, the prayer of Yetzirah, from there to the realm of reason and the intellect, the world of B’riyah and to the summit, the world of the intuition, Atzilut. How am I to apply this in my consensus reality and with my family and other contacts? How am I to act in a manner that will lead to the healing of our planet and society? This part is called the bringing down of the Divine influx, yeridat hashefa’. You may need to pick some paragraphs from each plane of prayer if all of it is too much for you. Some days you may wish to vary some parts and say others. This ‘siddur’ is meant to help you stay in daily touch with God, to gain blessed assistance from God, to lighten your burdens, not to add to them. Then recite some of the sentences of blessings and proceed with your daily tasks. When Reb Zalman shared his siddur with the Open Siddur Project in 2009, it was the first contribution of a contemporary translation of the siddur with an Open Content license. Thank you so much, Reb Zalman! 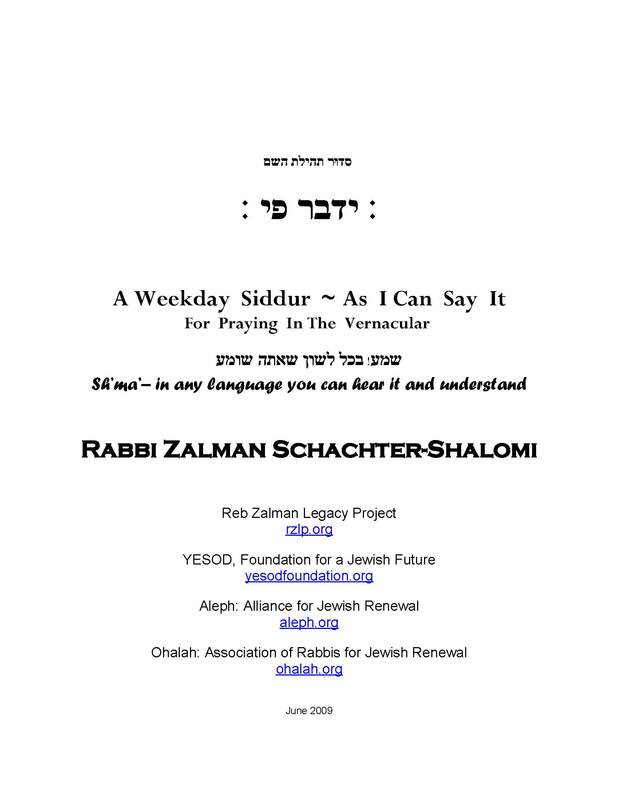 “סידור תהילת ה׳ ידבר פי | Siddur Tehillat Hashem Yidaber Pi: A Weekday Siddur ~ As I Can Say It (for Praying in the Vernacular), by Rabbi Zalman Schachter-Shalomi (2009)” is shared by Zalman Schachter-Shalomi with a Creative Commons Attribution-ShareAlike 4.0 International copyleft license. Please reciprocate for any adaptation or redistribution of this work by (1) properly attributing the work to Zalman Schachter-Shalomi, (2) clearly indicating the date you accessed the resource and whether any changes have been made (and if so, please be in touch with us and leave a comment below so that we might note your adaptation or improvement), (3) providing a link back to this source, and (4) specifying the Creative Commons Attribution-ShareAlike (CC BY-SA) 4.0 International copyleft license under which this work was shared. 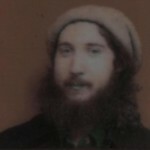 2011-07-19 – 18 Tammuz 5771 at 4:22 pm · Reply. Thank you for helping people to achieve and meet Hashem. 2017-03-30 – 4 Nisan 5777 at 8:12 am · Reply. 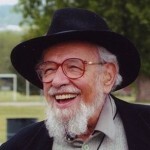 I have an mp3 of Reb Zalman reading the amidah that I could share, if you’d like to include it here? 2017-03-30 – 4 Nisan 5777 at 8:17 am · Reply. Please do. We can host it. 2017-08-31 – 10 Elul 5777 at 9:04 am · Reply. 2018-08-28 – 18 Elul 5778 at 4:31 pm · Reply. Jewish Renewal Hasidus » Blog Archive » Oh Davvener, Adieu! 2014-11-22 – 29 Heshvan 5775 at 1:38 pm · Reply.